Yesterday my parents and I accompanied my daughter’s class on a field trip to San Francisco. The school rented a small tourist bus for the trip. As I climbed aboard and took my seat alone by the window (my daughter wanted to sit with her friends in the very, very back, and my parents wanted to sit together), I experienced a strong sensation of familiarity, of bodily recollection. “Rock, paper, scissors, over and over, from the back of the bus,” I wrote in my journal. 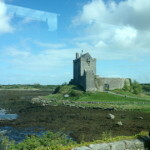 “I’m here, and yet I almost feel like there’s another me on another bus headed for the airport, alone, and another me on another bus crossing Ireland.” Then I realized that it has been about one year since I left on that journey. I pulled out my phone, went to Google calendar, scrolled back to May 2013. Was this very day, May 8, the day I departed? Empty. No trace of Ireland in my phone. How can that be true? 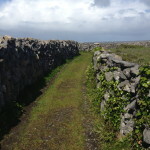 What is the trace of Ireland? That is what I have been writing about, what I’ve been living with, this whole last year. 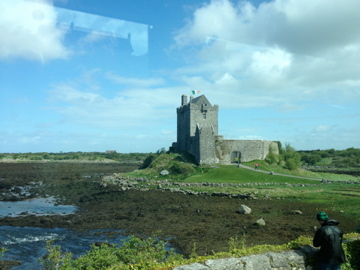 On my way to Ireland, May 8, 2013. The bus is rocking and speeding over asphalt, broken white line zipping past in my peripheral vision. Fighting the urge to check Facebook comments on my ever-present phone. Writing is messy, caffeine headache, eyes itching from leftover tears. Just write. Just begin. Just put one foot in front of the other. There’s the bay. There’s San Quentin, squatting massively picturesque in the grey-gold light. Boats moored, storage barns, old stores, box stores, cars moving, trucks rusting, heart unsteady, holding it together. Just the other day I sang “Me and you, stuck together like glue” to my children, and here I am, here I go. I’ve never left on a trip so open-hearted, empty of words and goals and expectations. I have a map and a little book of history, and a loose intention, to cultivate devotion and care and rest in trust and open space. Headed across the Golden Gate Bridge. Through the Eucalyptus groves of the Presidio. Orange pulsing light of tunnel. Toes cold. Stomach turning. Landing in Dublin. All I can see are clouds. My parents read my magazines while I desperately, bumpily, try to write. Grab every moment, and try to notice what’s going on. A longing, a wondering. There’s a me by the river in Galway, watching another me, that woman I saw from behind last year who looked almost exactly like me, in sweatpants, walking her dog. That me lives there, is settled there, rooted there. But I know that me is restless inside, too, with a longing, a wondering inside, about another place, another life, far away. Orange light and hush of tunnel. There’s the bridge. I am still trying to just write. I am still trying to just put one foot in front of another. I am still trying to make that trip open-hearted, empty of words and goals and expectations. What marks the difference between this year and last is caught only in that moment of knowing with certainty that she is restless, too, that other imagined me. There is no magical site of solidity, of happiness, across the windswept ocean. There are places of power, and stories of power, and I have journeyed through some of them this past year. 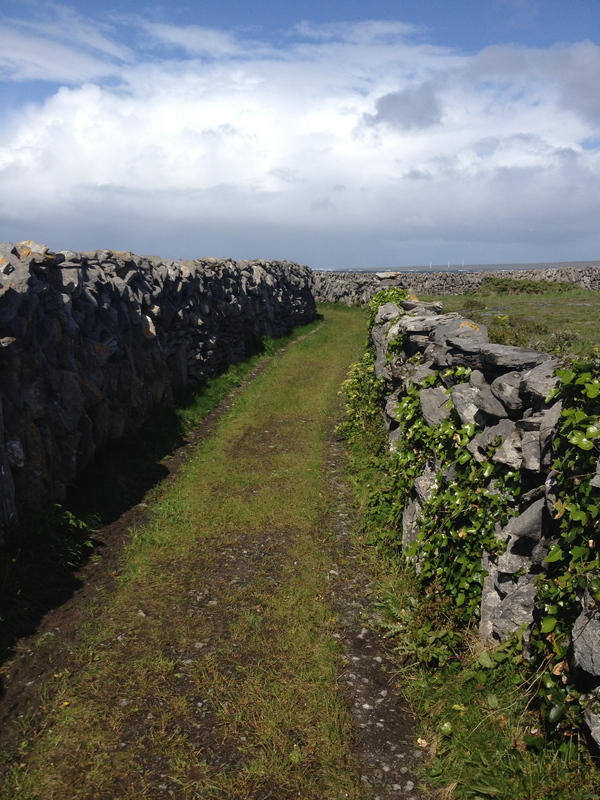 But I found these places and stories both in Ireland and in my own backyard. And right now, all I can see are clouds. I still want to know what the trace of Ireland is in my soul, what the “Ireland project” might become. That desire has a deep hungry feeling inside it, that feels like part of the story. So I guess I’ll just keep sitting, keep writing, keep walking, and see where I end up. And maybe, who knows, I’ll end up back in Ireland some day. Or maybe the story’s right here. Inside the tunnel. Inside the clouds. May 9, 2014 in storytelling, writing.